Today , October 28 is the dearest Feast day of two of the Holy Apostles, Saints Simon and Jude . Having followed the Lord, they contributed greatly to the building of the early Church. Saint Apostles Jude Thaddeus and Simon are examples of holiness and zeal , but one thing that seems important to note is this: Holiness of life and zeal in spreading the faith are the normal result of God’s call and His life within us. Both Apostles were among the twelve disciples, and Saint Jude is also known as Thaddeus to distinguish him from Judas the infamous traitor of our Lord Jesus . According to tradition, Saint Simon was one of the shepherds to whom angels revealed the birth of Christ. He and Jude joined together in preaching the gospel in Syria and Mesopotamia, and both were martyred in Persia. Saint Jude has become particularly popular in our times as "patron of hopeless cases." This patronage is said to have developed because in ancient times nobody invoked him for anything--his name too closely the same with that of the traitor disciple, Judas. Consequently, grateful for any notice from the faithful, he favors even the most desperate situations of those who pray to him . May the Lord grant many miracles and graces through the intercession of these two great witnesses to Christ , Saint Apostles Jude Thaddeus and Simon the Zealot . Almighty God, You chose Your servants Simon and Jude to be numbered among the glorious company of the Apostles. As they were faithful and zealous in their mission, so may we with ardent devotion make known the love and mercy of our Lord and Savior Jesus Christ, who lives and reigns with You and the Holy Spirit, one God, now and forever. Amen. Saint Anthony Mary Claret . In 1849 , Saint Anthony Mary Claret gathered together five priests who formed the basis of the Missionary Sons of the Immaculate Heart of Mary (popularly known as Claretians). At the suggestion of the Queen of Spain, Isabella II, Anthony was named archbishop of Santiago, Cuba (1850). For the next seven years he made pastoral visitations, preached against the slavery of the Negroes, and regularized numerous marriages. As a result of his activity he was frequently threatened with death and on one occasion an attempt was actually made on his life. In 1857 he was recalled to Spain as confessor to the queen. In 1869 he was in Rome, preparing for the First Vatican Council. He followed Isabella II into exile and at the insistence of the Spanish ambassador, was placed under house arrest in the Cistercian monastery at FontFroide, where he died at the age of 63. Saint John of Capistrano's Feast was formerly March 28 . Saint John of Capistrano was taken prisoner when Malatesta di Rimini conquered Perugia and is said to have had a vision in which St. Francis of Assisi invited him to enter the Franciscan Order. This he did, and he made his religious profession in 1418. His master was Bernardine of Siena and after his ordination in 1425 he dedicated himself to preaching and being a promoter of the Franciscan reform. The new Opening Prayer for the Mass says that God "raised up St. John of Capistrano to give your people comfort in their trials. " In fact, the victory over the Turks was attributed to St. John, who held high the standard with the monogram of the name of Jesus (drawn by St. Bernardine of Siena) and urged the 4,000 crusaders to invoke the name of Jesus. The city was saved and the enemy withdrew, as St. John had seen would happen in a previous vision. The Office of Readings offers an excerpt from St. John's treatise, Mirror of the Clergy, which was addressed to those who exercise the ministry of preaching. It is still applicable to priests of our time: "Presbyters who are born leaders deserve to be doubly honored, especially those who labor in preaching and teaching.... They have been placed here to care for others. Their own lives should be an example to others, showing how they must live in the house of the Lord." Lord, You raised up Saint John of Capistrano to give Your people comfort in their trials. May your Church enjoy unending peace and be secure in Your protection. We ask this through our Lord Jesus Christ, Your only begotten Son, who lives and reigns with You and the Holy Spirit, one God, for ever and ever. Amen. God, we thank you for the glorious company of the Apostles, and especially on this day for Simon and Jude; and we pray that, as they were faithful and zealous in their mission, so we may with ardent devotion make known the love and mercy of our Lord and Savior Jesus Christ; who lives and reigns with Thee and the Holy Spirit, one God, for ever and ever. Amen. Saint Simon and Saint Jude were apostles, which means they were followers of Christ. After Christ's Resurrection and Ascension into Heaven, the apostles travelled all over the world, bringing the word of Christ to the people. This is what Christ asked them to do, and he gave them instructions on how they were to travel and what they were to teach. These two apostles probably did not travel together. Saint Jude preached the Gospel in Judea, Samaria, Syria, and Mesopotamia. When he was quite old, in 62 AD, he returned to Jerusalem to help with the selection of a bishop for Jerusalem. It is interesting to realise that in just 62 years, or maybe even less, the Church that Jesus Christ began by giving his life, and that the Apostles build and spread with their lives, had grown so large that it needed bishops to help the priests and deacons look after and teach the people. Saint Jude, Helper of the Hopeless, is one of the most invoked saints of our century. He is the saint of the impossible, and it is said that he never fails to bring relief to those in desperate need. We turn to Saint Jude when all else fails. The flame of the Holy Spirit always burns over his head. He is a powerful presence, ever ready to step in and take control of a desperate situation. Because he was ever faithful to Christ and with him at the very beginning, he is in an especially exalted state of grace and can easily negate all common trials and tribulations. Jude Thaddeus was one of the original Twelve Apostles. Brother of James the Lesser and a cousin of Jesus, he grew up with Christ and played with him as a child. He is venerated in France and in Rome, where his relics are located; but devotion to Saint Jude all but disappeared in the Middle Ages. Because he was often confused with Judas Iscariot, the apostle who betrayed Christ, no one ever invoked Saint Jude for anything. This is why he became the saint of the impossible. In order to have people invoke him, he helped those in the most difficult circumstances. When a request is granted, the person praying must publish his thanks to Saint Jude. This way, more people will know to call on him. Daily and weekly newspapers are filled with small ads thanking him for his intercession. In his time, Saint Jude Thaddeus was known for his greatness of heart. It is said that he was so kindly and spiritual in nature, he glowed. He traveled through Edessa, Mesopotamia, and Pontus preaching Christianity. Abgar, the king of Edessa, was quite impressed with him. Since this king suffered from leprosy, he was anxious to meet Jesus so that he might be cured. He invited Jesus to come and share his kingdom. When he was told that this was not possible, he commissioned an artist to draw Christ’s portrait. The artist was so intimidated by the glow in Christ’s eyes, he could not draw. Christ took a linen cloth and impressed it on his own face. His image came off on it, perfectly rendered. Saint Jude took this portrait back to King Abgar, who rubbed it on his body and was cured of his leprosy. This is the large image that Saint Jude wears around his neck in art. Saint Jude is associated with Saint Simon, with whom he traveled to Persia. They were subjects of great curiosity and popularity among the people of the places they traveled. They frequently outwitted court magicians and priests, to the amusement of the local kings. Invited to have their losing antagonists executed, as was the custom of the day, the two apostles forbade this, saying they had been sent not to kill the living but to bring the dead back to life. Ultimately, Saint Simon and Saint Jude were martyred in the city of Samir after enraging the local priests. Saint Jude was beaten to death with a club. This is the staff he is always shown with in art. prayer and acts of reparation. when you joined the Franciscans. You sought God's help in prayer and fasting in monastic quiet. My duties in life seldom offer chances for solitude and quiet prayer. Distractions are all around me. Help me, nevertheless to cultivate interior silence even amid my daily work. and the recollection of God's presence always in my heart. Please assist me to do so for love of Christ, our Lord. Today the Catholic Church celebrates St. Luke described as the beloved physician by St. Paul. The book of Luke is one of the four gospels, which tell of the life and teachings of Jesus Christ . His gospel above all others focuses on the merciful kindness of Jesus to the poor, the afflicted and sinners. Some believe that his attention to detail as a result of his physician's training no doubt impacted the detailed completeness of his account. He reports on Jesus' birth and childhood in a way that has led scholars to the conclusion that he was in direct communication with Mary as he wrote his gospel. "His mother stored up all these things in her heart. "(Lk 2:51) In fact Saint Luke wrote more about Mary than anyone else in the Bible. Tradition holds that Luke learnt these stories from Mary herself while scholars believe that he wrote his gospel account for a Gentile audience and thus places the events of Jesus' nativity in the context of world history by beginning with the mention of the census decreed by Caesar Augustus. Luke traveled with Paul as he spread the Good News of Jesus Christ along the roads and ports of the Roman Empire. Even when Paul was thrown in prison, Luke stuck by him when few would. It is from Saint Luke that we get the stories of the Three Wise Men, the Prodigal Son, the Road to Emmaus, the Annunciation (where the angel Gabriel visits Mary) and many others. Our beloved Saint Luke died at the age of 84. Jerome says he died in the Holy Spirit in Bithynia, now known as northern Turkey. A thousand years later when the Turks made war on his hometown of Antioch, a man in white appeared to those praying in the church of St Mary of Tripoli. They say it was Luke. This gave the Christians the strength to hold out against the Turks. Almighty God, who didst inspire Thy servant Luke the physician to set forth in the Gospel the love and healing power of Thy Son our Lord and Savior Jesus Christ : Graciously continue in Thy Church the like love and power to heal, to the praise and glory of Thy Name; through the same Thy Son Jesus Christ our Lord, who liveth and reigneth with Thee, in the unity of the Holy Spirit, one God, now and for ever. Amen. Today we remember St. Margaret Mary Alacoque, the Apostle and Saint of the Sacred Heart of our Lord and Savior Jesus Christ. In the first great revelation, our Lord Jesus Christ made known to her His ardent desire to be loved by men and His design of manifesting His Heart with all Its treasures of Love and Mercy, of sanctification and salvation. He appointed the Friday after the octave of the feast of Corpus Christi as the feast of the Sacred Heart; Lord Jesus Christ called her "the Beloved Disciple of the Sacred Heart", and the heiress of all Its treasures . The Love of the Sacred Heart was the fire which consumed her, and devotion to the Sacred Heart is the refrain of all her writings. In her last illness she refused all alleviation, repeating frequently: "What have I in heaven and what do desire on earth, but Thee alone, O my God", and died pronouncing the Holy Name of Jesus . She was canonized by Benedict XV in 1920. When her tomb was canonically opened in July, 1830, two instantaneous cures took place. Her body rests under the altar in the chapel at Paray, and many striking favors have been obtained by pilgrims attracted thither from all parts of the world. Below is a very powerful prayer written by St. Margaret Mary.. I, ( our name. .), give myself and consecrate to the Sacred Heart of our Lord Jesus Christ my person and my life, my actions, pains, and sufferings, so that I may be willing to make use of any part of my being save to honor, love, and glorify the Sacred Heart. I therefore take Thee, O Sacred Heart, to be the only object of my love, the guardian of my life, my assurance of salvation, the remedy of my weakness and inconstancy, the atonement for all the faults of my life and my sure refuge at the hour of death. Be then, O Heart of goodness, my justification before God Thy Father, and turn away from me the strokes of His righteous anger. O Heart of Love, I put all my confidence in Thee, for I fear everything from my own wickedness and frailty; but I hope for all things from Thy goodness and bounty. Today October 16th, we're celebrating the Feasts of St. Margaret Mary and St. Hedwig (in the new liturgical calendar) . It is also the feast of St. Gerard Majella . In these times when human life is so threatened we should not forget St. Gerard Majella because he is the patron of expectant mothers (along with St. Raymond of Nonnatus) , and a patron of children, a good confession, and of those falsely accused. Our blessed Saint Gerard was remarkable for his apostolic zeal, patience in sickness, love for the poor, deep humility in the face of false accusation, heroic obedience, spirit of penance and constancy in prayer. He wrote numerous letters of spiritual direction. The Lord favored him with many spiritual gifts, including prophecy, the reading of people’s hearts, and the gifts of miracles. St. Gerard, you lived your life among people who asked for your prayers and blessings in the many concerns of their lives. In your kindness you presented their needs to Jesus and obtained an answer to their prayers. Help all those who call upon your intercession to experience the healing presence of Christ within them. Our confidence is strengthened by your words of encouragement, "Trust with lively faith that you will receive everything from God." Be a friend to us, St. Gerard, and help us to walk in the light of Christ. Following your example, may our lives proclaim the love and mercy of Jesus in all our actions. Amen. Today the Holy Church celebrates the feast of one of the most beloved of the saints, St. Teresa of Avila . She is a great model of Catholic obedience, fiery Catholic love, deep prayer and she continues to bless the Church with her intercession . Saint Teresa's writings on prayer and contemplation are drawn from her experience: powerful, practical and graceful . Though a contemplative, she spent much of her time and energy seeking to reform herself and the Carmelites . In her prayers and in her life, in her efforts to reform, in all the people she touched, she expressed holiness . In 1970, the Church gave her the title she had long held in the popular mind: doctor of the Church. She and St. Catherine of Siena were the first women so honored. As she matured in wisdom, Saint Teresa's trust in God's providence became total and complete and each cross she turned into a precious crown. She said that nothing is insignificant in our lives. Every event represents a divine opportunity, a divine call, a definite contribution to the intricate design of God's providence. Saint Teresa is a marvelous guide for us to learn to pray to the highest degree . Almighty God, who, when the hearts of your people have grown Cold, send your Spirit to relight the flame of your love in their hearts, and raise up faithful ministers to recall your people to their former devotion and service: Mercifully grant that we, following the teaching and example of Teresa of Avila and others, may be filled with your Holy Spirit, may be aflame with zeal for your glory and love for your goodness and hunger for your love, and that our feet may be set upon the path that leads to true holiness; the which we ask through Jesus Christ our Lord, who lives and reigns with you and the Holy Spirit, one God, now and ever. you are Raphael the companion, ever at human sorrow's side." The feast day of St. Raphael reminds us that he is an eminent intercessor – a special patron of the sick and travelers – who brings our prayers to God. He is one of the highest angelic spirits that assist God and, therefore, has conditions to ask God for the graces we need. Saint Archangel Raphael Feast was celebrated on October 24th, according to the Roman liturgical calendar before Vatican II, but is now on September 29th along with Saints Archalgels Michael and Gabriel. Even so , I'm keeping unchanged the traditions and the values of our 2000 years old Catholic faith , and I'm inviting you all pray another awesome Novena for the Feast of Saint Archangel Raphael , one of the Seven who stand before God” (Tob. 12:15 ) and whose name means the God has healed . May God's healing be upon each one of us and upon the entire earth ..Let us ask him to help us to reach Heaven in order to contemplate the Lord . We should also ask him to help us maintain a constant consideration of the celestial order to give us consolation and the hope of Heaven and the Reign of Mary in the increasingly sad days in which we live. For the Novena check on my other catholic blog : Time to Pray . God bless and keep each one of you ! On the ninth day of the Novena to Saint Teresa of Avila, we ask our Lord Jesus Christ for the grace of a good end of life and passing to eternity , that we may die burning with Love for Him, as Saint Teresa did. St. Teresa, pray for us. That we may become worthy of the promises of Jesus Christ. Graciously hear us, O God of our salvation! that as we rejoice in the commemoration of the blessed virgin Teresa, so we may be nourished by her heavenly doctrine, and draw from thence the fervor of a tender devotion; through our Lord Jesus Christ, Thy Son, Who liveth and reigneth with Thee in the unity of the Holy Spirit, God for ever and ever. Amen. O most beloved Lord Jesus Christ! we thank Thee for the eminent gift of the desire for eternity which Thou didst grant to Thy beloved Teresa; we pray Thee, by Thy merits, and by those of Thy most constant spouse, to grant us the grace of desiring passing to eternity in order to go and possess Thee eternally in the country of the blessed. On the seventh day of the Novena to Saint Teresa of Avila, we ask Christ that our heart may be wounded with Divine Love. O most loving Lord Jesus Christ! we thank Thee for the wonderful gift of the wound of Divine Love in the heart which Thou didst grant to Thy beloved Teresa; we pray Thee, by Thy merits, and by those of Thy seraphic spouse, to grant us also a like wound of Love, that, henceforth, we may love Thee and give our mind to the love of nothing but Thee. On the sixth day of the Novena to Saint Teresa of Avila, we ask our Lord Jesus Christ for the gift of devotion to His Immaculate Mother, the Blessed Virgin Mary, and His foster father, Saint Joseph, a devotion which He granted to Saint Teresa. O most bountiful Lord Jesus Christ! we thank Thee for the gift of devotion towards Thy sweet mother, Mary and her holy spouse, Joseph, which Thou didst grant to Thy beloved Teresa; we pray Thee, by Thy merits, and by those of Thy most dear spouse, to give us the grace of a special and tender devotion towards Thy most holy mother, Mary, and towards Thy beloved foster-father, Joseph. On the fifth day of the Novena to Saint Teresa of Avila, we ask our Lord Jesus Christ for the gift of humility, which He granted to Saint Teresa. O most kind Lord Jesus Christ! we thank Thee for the great gift of humility which Thou didst grant to Thy beloved Teresa; we pray Thee, by Thy merits, and by those of Thy most humble spouse, to grant us the grace of a true humility, which may make us ever find our joy in humiliation, and prefer contempt before every honor. V. St. Teresa, pray for us. On the fourth day of the Novena to Saint Teresa of Avila, we ask Christ for the desire and the resolve to love Him as Saint Teresa did. O most sweet Lord Jesus Christ! we thank Thee for the gift of great desire and resolution which Thou didst grant to Thy beloved Teresa, that she might love Thee perfectly; we pray Thee, by Thy merits, and by those of Thy most generous spouse, to give us a true desire, and a true resolution of pleasing Thee the utmost of our power. On the third day, we thank Christ for the gift of Love, the third of the three theological virtues, and ask Him to perfect the gift of Love in us, as He did in Saint Teresa of Avila. O most loving Lord Jesus Christ! we thank Thee for the great gift of Love which Thou didst grant to Thy beloved Teresa; we pray Thee, by Thy merits, and by those of Thy most loving spouse, to give us the great, the crowning gift of Thy perfect Love. ( the phrase "Thy most loving spouse" refers to the Church, the Bride of Christ) . Join me in Novenas , prayers and commemorations for the following Feasts , starting with Novena for the Feast of Margaret Mary Alacoque , the beloved Saint and Apostle of devotion to the Sacred Heart. God bless you all praying ! On the second day of Novena , we thank to our Lord Jesus Christ for the gift of Hope, the second of the three theological virtues, and ask for confidence in His goodness, which we have seen through His sacrifice on the Cross, during which He shed his Precious Blood. O most merciful Lord Jesus Christ! we thank Thee for the great gift of Hope which Thou didst grant to Thy beloved Teresa; we pray Thee, by Thy merits, and by those of Thy holy spouse, to give us a great confidence in Thy goodness, by reason of Thy Precious Blood, which Thou hast shed to its last drop for our salvation. On the first day, we thank to our Lord Jesus Christ for the gift of Faith, one of the three theological virtues, and for the gift of devotion to the Eucharist, and we ask Him to increase those gifts in our souls, as He did for Saint Teresa. St. Teresa of Avila , pray for us. October 15 is the feast day of Saint Teresa of Avila, blessed virgin and doctor of the Church . Our beloved Saint Teresa was mainly responsible for the renewal, reform, and the expansion of the Carmelites throughout Spain , despite major disappointments, setbacks, and discouragements, nothing prevented her from staying focused in doing God's holy will in all manners . She assures us that those who practice prayer faithfully will receive all they ask beyond their greatest expectations and hope . Despite the insurmountable hardships she faced, her faithfulness to prayer , and docility to the Holy Spirit to carry out her call and mission, never wavered despite great controversies and sufferings. Her trust in God and Jesus Christ, her Beloved, was what she treasured and what she held onto with her whole being. She confessed that "...I know from experience-namely that no one who has begun this practice (of daily prayer) however many sins he may commit, should never forsake it." The virgin of Carmel writings inform us today that it is within ourselves that we will discover the meaning of Jesus' words. "My house will be called a house of prayer". She is for the entire world to know, appreciate, and savor that the kingdom and Christ the King dwells within each creature in their interior 'home'. Saint Teresa of Avila experienced what the church has always taught regarding Jesus' presence. He is actually present Body, Soul, Blood and Divinity on our altars and holy tables through the consecrated bread and wine. And He remains in all Catholic Churches around the world where the Blessed Sacrament is reserved in the tabernacles. He is also present in a special manner in the soul and body of every creature on the face of the earth. Therefore let us follow the virtuous example and faithfulness of Saint Teresa of Avila and pray the Novena for her blessed Feast ( with the help of Novena written by St. Alphonsus Liguori ) . God bless and keep you all ! "Have confidence, My child. Do not lose heart in coming for pardon, for I am always ready to forgive you. As often as you beg for it, you glorify My mercy." Today we remember Saint Faustina as a great woman of true Faith and of God , but we remember also the message she brings from our Lord Jesus, that we can never fathom the depths of God's infinite Mercy and Love. Saint Faustina was chosen by God to help promote the importance of Divine Mercy. Through her , we are given the most precious treasure that catapults us into the Divine Mercy of God. Our Lord gave many great mystical graces to Sister Faustina of the Sisters of Our Lady of Mercy in Poland. He also gave her a mission - to tell the world that He is Mercy itself, and that before He returns as a just Judge, He is coming as a merciful Savior. Jesus called Faustina His “Secretary of Divine Mercy”, and commanded her to write everything He told her. In obedience, Faustina kept a diary, now called "Divine Mercy in My Soul" . Over 7 times our Lord Jesus Christ told her that this message would prepare the world for His final coming. Sister Faustina led a seemingly ordinary life. However, her life was anything but ordinary. From the time she was a little girl to her death in 1938, her life was a constant dialog with Our Lord, Our Blessed Mother, the saints, and the angels. The evil tried on numerous occasions to dissuade her from her mission, even appearing to her in the form of wild dogs threatening to tear her to pieces. Even so , our beloved Saint Faustina won over evil's different attacks and manifestations through her great Faith and devotion , for the great Glory of God . May beloved and blessed St. Faustina continue to pray for all those who seek her intercession and may God bless us with His unfathomable Divine Mercy! Today is the feast day of our beloved St. Francis of Assisi (1182-1216), founder of the Franciscan order, mystic and bearer of the stigmata . There is often the temptation to look at Saint Francis as a purely 'secular hero' , an animal lover and ecology patron . But the truth is that beloved Saint Francis was the great person he was because of his deep and intimate love for Lord Jesus and his overwhelming awareness of the presence of Providence in his life. Today as we celebrate the life of Francis we need to ask the Lord through his intercession to make us 'channels of His peace' in this world and to give us the wisdom to realize our future as humans is closely tied to the future of the rest of nature as a whole. St. Francis used to say that nothing is more important than the salvation of souls, and he often offered as proof the fact that the Only-begotten of God deigned to hang on the cross for souls. Prayer was the most comfort for Francis in this life of contemplation in which he became a fellow-citizen of the Angels, as he penetrated the dwelling places of Heaven in his eager search for his Beloved Jesus , from whom he was separated only by a partition of flesh. St. Francis felt like an exile, as long as he remained in this earthly life separated from God, and at the same time, his love of Christ had left him insensible to all earthly desires. Therefore, he tried to keep his spirit in the presence of God, by praying to him without intermission, so that he might not be without some comfort from his Beloved. Whether he was walking or sitting, at home or abroad, whether he was working or resting, he was so wholeheartedly intent on prayer that he seemed to have dedicated to it not only his heart and soul, but all his efforts and all his time. of the Heavenly Father entrusts me. 'Send Me Your Guardian Angel', is a marvelous book about Saint Padre Pio's relationship with his Guardian Angel. Saint Pio would send his angel on errands and have him do all sorts of things that the good padre could not do easily himself. Padre Pio had a great devotion to the Angels and had a special devotion to his Guardian Angel. He was on intimate terms with St Michael and the Angels. Towards the end of his life, Padre Pio spoke with affection of his Guardian Angel as 'the companion of my infancy.' While he was still a boy, his Guardian Angel appeared to him in the semblance of another child. His Guardian Angel helped him in his noviciate year and during his studies in preparation for the priesthood. Padre Pio's Guardian Angel helped him to become holy and was near him in the assaults of the devil and often helped him. For example, with his Guardian Angel's help, Padre Pio was able to understand the contents of letters written in French and Greek, although he did not know either of these languages. Both inside and outside the confessional, Padre Pio would encourage people to have devotion to the Angels. In farewelling pilgrims, Padre Pio would use such phrases as: 'May the Angels of God accompany you.' 'May the Angel of God be for you light, help, strength, comfort, and guidance.' To some of his penitents in great need, Padre Pio would tell them to send their Guardian Angels to him. He would encourage his penitents and pilgrims to visit the shrine of St Michael the Archangel on Mt Gargano before going home. During the fifth century, St Michael appeared in visible form in a cave in the mountainside on Mt Gargano and revealed to the local Bishop that the mountain was under his special protection for the honour of God and the Holy Angels. Heavenly Father, Your infinite love for us has chosen a blessed angel in heaven and appointed him our guide during this earthly pilgrimage. Grant that we may experience the assistance of our holy protector in all our necessities. And you, holy, loving angel and guide, watch over us with all the tenderness of your angelic heart. Keep us always on the way that leads to heaven, and cease not to pray for us until we have attained our final destiny, eternal salvation. We shall praise and glorify you unceasingly for all the good you have done for us while here on earth. Take our place, and supply what may be wanting to us through human frailty, short-sightedness, or sinful neglect. Truly our God Almighty Father is awesome , that He made and assigned each one of us an angel to protect and guide us. Angels are servants and messengers from God. “Angel” in Greek means messenger. In unseen ways the angels help us on our earthly pilgrimage by assisting us in work and study, helping us in temptation and protecting us from physical danger. Angels are a dogma of the Catholic Faith. Every Sunday Mass when we recite the Nicene Creed (dating from the year 325), we restate our belief of the creation and existence of angels, implicit in the phrase "We believe in one God, the Father Almighty, maker of heaven and earth, of all that is seen and unseen (or other translations of all things visible and invisible)..."
The Credo of the People of God (Pope Paul VI, 20 June 1968) further explains the phrase: "We believe in one God, the Father, the Son and the Holy Spirit, Creator of what is visible--such as this world where we live out our lives--and of the invisible--such as the pure spirits which are also called angels." From the Catechism of the Catholic Church we read that " existence of the spiritual, non-corporeal beings that Sacred Scripture usually calls "angels" is a truth of faith. The witness of Scripture is as clear as the unanimity of Tradition" (328). The role of angels most pertinent to our spiritual lives is our guardian angel. Every person is given a guardian angel because as Eusebius puts it: "Fearing lest sinful mankind should be without government and without guidance, like herds of cattle, God gave them protectors and superintendents, the holy angels in the form of captains and shepherds" (Dem. Ev., 4, 6). We are never without our protector, and the more we request their help, the more he can help us. A guardian angel's roles are threefold: 1) angel of peace, 2) angel of penitence (or penance) and 3) angel of prayer. As an angel of peace, they protect against danger, both bodily and spiritual threats. They also can give peace and comfort to the soul when undergoing tribulations, like Jesus during his agony in the Garden. As an angel of penance or penitence, our angel has the office of chastising and correcting us when we stray from God's path. The angel also helps us in restoring our soul to health after we sin, helping us obtaining remission of our sins. As an angel of prayer, the guardian angel presents our prayers to God, both liturgical and private prayers. "The angel, indeed, of each one, even of the little ones in the Church, always seeing the face of the Father who is in heaven and beholding the divinity of our Creator, prays with us and cooperates with us, as far as is possible, in what we seek"
It's time of the year to remember and celebrate Saint Therese , Little Flower of Child Jesus . She is a true Saint of modern time , always there for us to pray and help us in every difficult moments of our lifes . Her intercessory powers are extraordinary because of her ordinary and simple confidence, trust and hope in her loving Brother-our Eternal God! God infused into Therese the gifts of the Spirit. She received God's wisdom, knowledge and understanding in abundance. Therese believed that since God is total Spirit and all powerful, the Almighty would grant her this request because of her extraordinary confidence. Through her intercession we can gain increased confidence and trust in a pessimistic world around us. We only need to do little things well and the big ones will fall into place. We need to practice ordinary things such as daily prayer. That's the biggest challenge because we do not always feel like praying. God is in the ordinary and plain events and circumstances of daily life. We can find the Almighty anywhere. God's likeness and image inundate us. The Deity's signature, glance and invitation are written on every flower, every smile we offer and every kind word we extend . 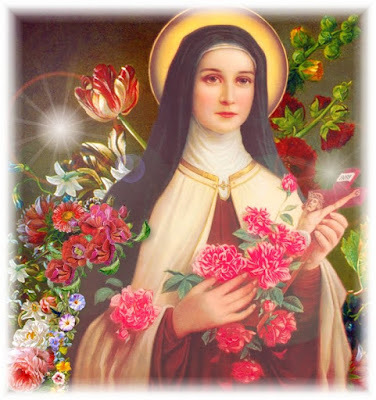 Saint Therese is only the second doctor of the church in the Modern Era category. The other one is Alphonsus Liguori who died in 1787. "In response to the many requests and after much attentive study, I have the joy of announcing that on Mission Sunday, October, 19th, 1997, in St Peter's Basilica in Rome, I will proclaim St Therese of the Child Jesus and the Holy Face, a doctor of the Church. I have wished to solemnly announce this event here (the Vicar was in France) because the message of St Therese, a young holy woman so present to our times, is of particular interest to you, young people. At the school of the Gospel, she indicates to you the path of Christian maturity. She calls you to an infinite generosity; she invites you to remain in the heart of the Church as disciples and ardent witnesses of Christ's charity. ""Therese's teaching" the Holy Father said, "is a true science." It is the luminous expression of her knowledge of the mystery of Christ and of her personal experience of grace. She helps the men and women of today and she will help those of tomorrow to be more aware of the gifts of God and to spread the Good News of God's love. She would encourage us to trust in the church's 2000 years of motherly wisdom and riches.